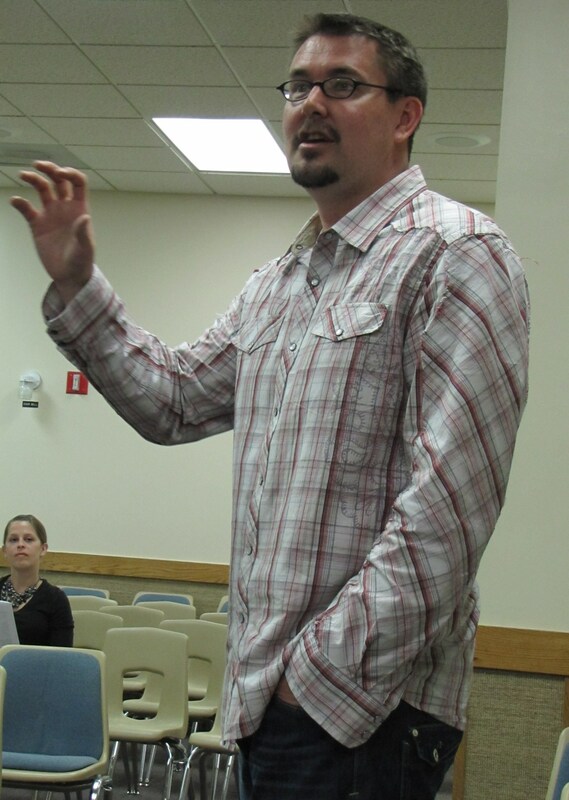 Lead Pastor Mark Batterson of National Community Church (NCC) announced to ANC6B Commissioners Tuesday night, that the NCC had purchased The People’s Church at 535 8th Street, SE, and will take possession on June 1. In the spirit of being a good neighbor and adding something to Barracks Row, Batterson said NCC will turn the space back into the theater it once was from 1910 until 1960. The Church has seven other locations in the DC area; church members meet in theaters in six of them. Services will be held Sundays, but at other times it will be an entertainment venue. The intent is to build it out to be a live performance space with lights, sound, and acoustics that can accommodate other types of entertainment. There will be concessions to contribute to the theater atmosphere, though the concession area might have to be in the basement since it is not possible to increase the size of the lobby. The purchase price for The Peoples’ Church was $3 million. Batterson said they were willing to pay top dollar because it would help The Peoples’ Church move to Maryland where the majority of their congregation is. Most of the National Community Church congregation lives on Capitol Hill. According to Wikipedia, NCC is focused on reaching emerging generations – about 70% of NCCers are single adults in their twenties. Asked by Commissioner Brian Pate if this purchase would affect NCC’s plans south of the freeway, Batterson said it would – “We didn’t see this coming.” NCC has purchased three parcels of land below the freeway, including the Miles Glass Company property. The plan was to build the theater there and anchor the area with an Ebenezer’s Coffee House on 8th Street. He said that a day care center and retail had also been planned. Now, “we’re in a spin cycle” and have to rethink what to do there. According to Wikipedia, NCC was recognized as one of the Most Innovative and Most Influential Churches in America by Outreach Magazine in 2008. Batterson and the NCC staff are known for their use of new media – since 2005, sermons have been available via podcast. Telecom Antennas for Hanes Building? CHRS is reviewing the historical preservation application from a major telecommunications company to install 15 telecommunications antennas and a backup generator on the roof of the Hanes Building at 801 Pennsylvania Avenue. The request will subsequently go to ANC6b Planning and Zoning Committee. The process for completing the final drawings for the Info Hub project for Eastern Market Metro Plaza has begun. Additional features for landscaping being discussed include a rain garden watered by runoff from the Info Hub roof, installation of a number of half benches, consolidation of the news vending machines under a shelter, and possibly a new and expanded shelter for personal bikes storage. Certain areas are being targeted for replanting with appropriate decorative plantings in demarcated beds. The goal will be to make the Plaza a welcoming gate to the community for those arriving at Eastern Market Metro. The Info Hub itself might include an ATM machine and interactive electronic information outlets allowing users to ask questions, call police, or hail a cab. Part of the annual maintenance costs of approximately $15,000 a year may come from the sale of tee shirts and coffee mugs at the Info Hub. In conjunction with the landscaping DDOT is considering expanding the bike share program with a larger bike rack and possible relocation to the east side of 8th Street. DDOT is holding a public meeting to solicit input on expansion of the bikeshare program. DC Redistricting Committee Member and Councilmember At Large Phil Mendelson told a crowd of over 250 Ward Six Democrats Thursday night that “it’s impossible to do redistricting without making some people unhappy.” He went on to note that reducing the size of Wards Two and Six would upset the fewest number of people. The 2010 Census revealed that Ward 2 has to come down at least 939, Ward Seven has to come up at least 387, and Ward 8 has to come up at least 743. Technically, Ward Six is within 5% of the average and – all things being equal – would not have to change. But it has population to spare and is next to wards seven and eight which need population. The City Council has until July 2011 to produce a new Ward boundary map and has until the end of 2011 to approve new Advisory Neighborhood Commission (ANC) and Single Member District (SMD) boundary maps. The Redistricting Committee, comprised of Councilmembers Michael Brown, Jack Evans and Phil Mendelson, will propose a new ward map in the next few weeks – maybe by the end of May. The Committee will hold a hearing on the new map and the Council will vote sometime in June to make any changes to the committee plan, with a final vote in late June or early July. 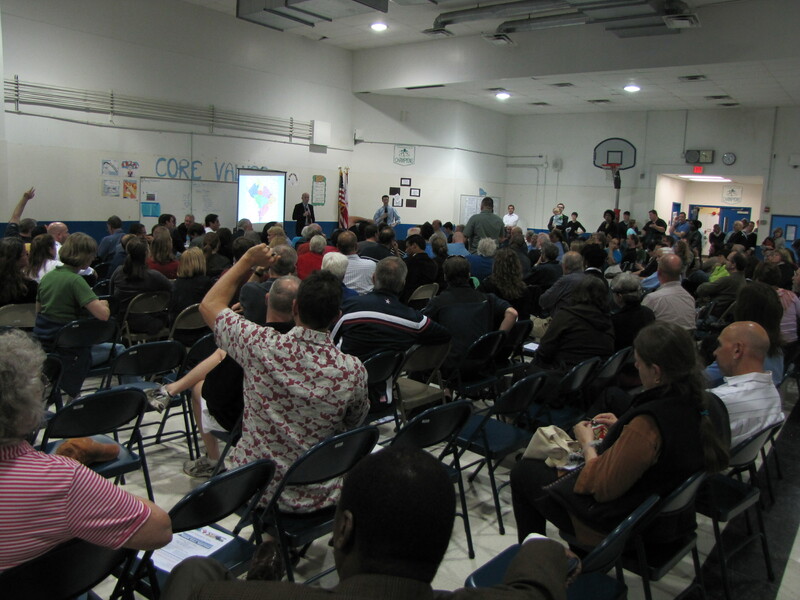 Thursday night’s meeting at Friendship Public Charter School was hosted by Ward Six Democrats to allow residents to voice their concerns on the redistricting issue. 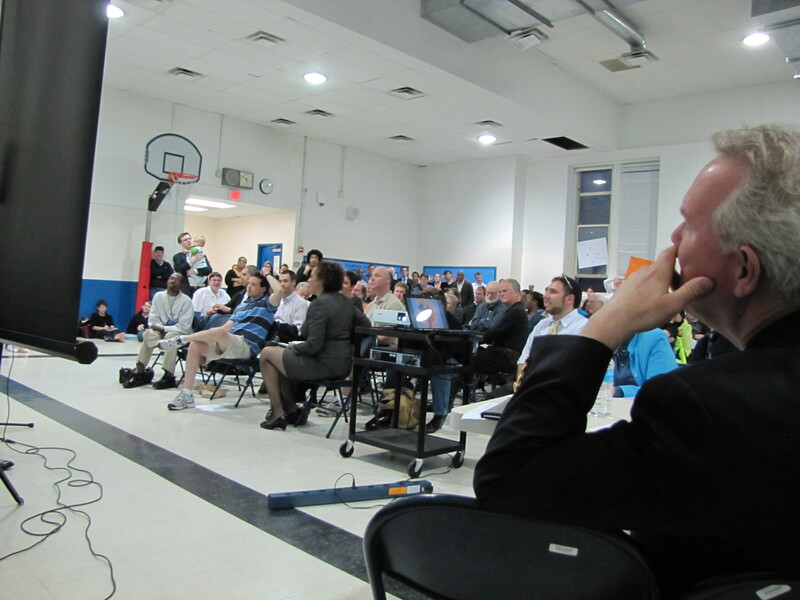 The meeting’s organizers invited the three members of the Redistricting Committee and Councilmember Tommy Wells. Only Mendelson and Wells appeared. Wells told those attending that the guiding principle for redistricting is that “we have to keep contiguous neighborhoods together.” He told this reporter that “Penn Quarter is on the table,” but he would otherwise “absolutely” vote against any legislation to reduce the size of Ward Six. Wells would like to broker a deal and give Ward Six’s portion of Penn Quarter to Ward 2, setting up a domino effect that would subsequently increase the size of Wards 5, 7, and 8, leaving all wards with the right numbers. He told the crowd, “[y]ou have power – beyond phone calls and email. Make sure – especially the at large members – know how you feel and why.” The at large councilmembers are Redistricting Committee members Michael Brown and Phil Mendelson and Councilmembers David Catania and Vincent Orange. Questions from the audience revealed concerns about the impact of redistricting on schools, the historic district, and parking. Mendelson said that school and historic districts would be unaffected by any changes. Regarding parking, he said he will propose to the Chair of the Transportation Committee Chair Tommy Wells, that current parking zones be maintained regardless of any ward changes brought about by redistricting.